The HVAC guys arrived at our house at 7:00am on Tuesday, and the fun began! They worked all day on Tuesday, arrived on Wednesday at 7:00am, and finished up Wednesday afternoon around 3:00. And finally, after two years of living with window units air conditioners in the summer and space heaters in the winter, we had a fully functional, energy efficient, top-of-the-line HVAC unit. And the difference is amazing. I know it sounds overly dramatic to call this life-changing, but it really is. Until you’ve lived through a Texas summer with only three window units cooling your 2500-square-foot home, you can’t really understand the difference in the quality of air. Window units blow out extremely cold air at the source, but it doesn’t disperse into the room evenly. So there are cold areas, and warm areas. Window units also tend to blow out humid air. I got used to it after a while, but it took me a very long time to get used to feeling sticky and damp when I slept. They all have “dry” settings, but then they don’t cool as well. The cool air from our HVAC unit fills every square inch of every room. From the moment I enter the front door, I can feel a difference. It feels like it’s literally wrapping around me like a blanket. And best of all, it’s not humid! The unit that we got is the Trane XV20i, which has a variable speed compressor that will increase or decrease in speed in 1/10th of 1% increments, based on what it needs to do the job at that very moment. And you can look at the thermostat and see the speed at which the compressor is currently running. In the bottom right corner, you can see that the compressor was running at 34% when I took this picture. Ugh…too bad I forgot to put up new drywall there before they installed the thermostat. 🙁 Now I’ll have to work around it. Anyway, the variable speed compressor is amazing, and that’s what makes this system so energy efficient. I’ve only ever had HVAC units that were either 100% on or off, and nothing in between. This variable speed stuff is completely new to me. And this unit is so quiet! I haven’t even once heard it come on or go off. The indoor unit is in the attic. 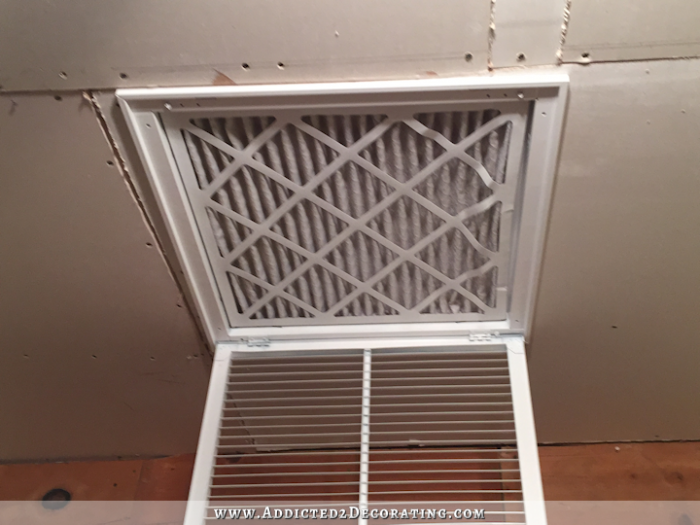 When I told people that we were putting it in the attic, the first question was always, “How are you going to change the filter?” I wondered that too, since every HVAC unit I’ve ever seen had the filter directly on the indoor unit. 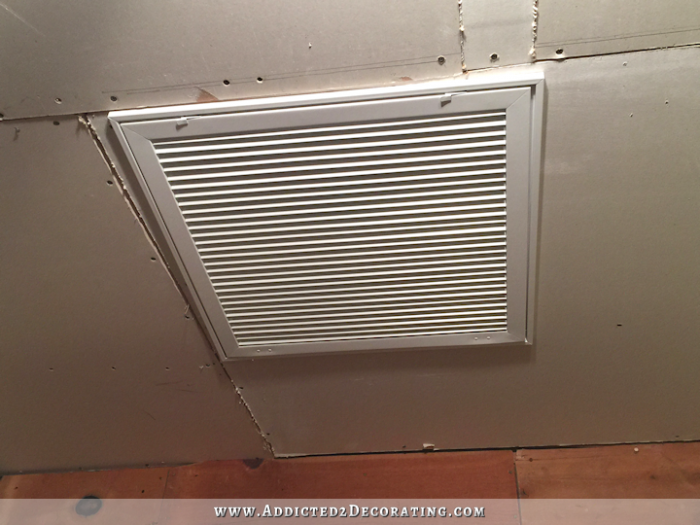 Would I have to crawl into the attic to change the filter? No. It’s actually quite easy. They put the return air duct in the hallway, and that’s where the filter goes. And no tools required! I just need a step stool to reach it, and there are two latches that pull down to open the vent. It couldn’t be easier! And as exciting as the HVAC is, I’m also pretty excited about finally having updated electrical service to our house. The electrician was here on Tuesday to hook up the HVAC system, but then he came back early on Thursday to upgrade our electrical service from 100 amp to 200 amp. He had told us that our air conditioner would probably be just fine on 100 amp service, but we might run into problems trying to heat our home during the winters. It didn’t take much convincing, because I’ve wanted this upgrade for two years now, regardless of whether or not our HVAC actually required it. I wish I had taken a picture of what was there before, but I completely forgot. It was an old rusted box with two very old fuses in it. And that’s it. That was all that was powering our whole house. And now we have shiny new boxes with all updated wiring and 200 amps of electrical service available to us. I just feel so much safer knowing that all of this is completely updated and up to current standards. Matt wants to keep the one in his game room at least for one more summer just in case. One of the worst parts of multiple sclerosis for him is extreme sensitivity to heat. If he gets hot at all, he loses muscle strength very quickly. So he wants to be really sure that the HVAC is going to cool his game room enough during the hottest part of the summer. I think the HVAC will keep his room plenty cool, but I’m also just fine with him keeping his window unit for peace of mind until he’s completely assured that the HVAC will cool his room sufficiently. And the third one in our bedroom has actually had to be used twice now since we’ve had our HVAC. One thing about new units that’s completely different from the 30- and 40-year-old units that I’m used to is the precise control of air that goes into each individual room. So they calibrated the amount of air going into each room based on the size of the room, the number of windows, the direction the room faces, etc. They told us to live with it like this for a week or two, and then call them to come make changes if any changes are needed. Well, we definitely need a change for our bedroom. What they didn’t consider is that each night, we have three warm bodies in our room (Matt, me, and our dog Boo…and sometimes our cat Peeve if she decides to grace us with her presence), plus two laptops that are always on. All of us, plus our computers, generate enough heat to make a significant difference in the temperature of the bedroom. So we’ll need to get that taken care of before I remove that window unit. So that’s what’s been going on around here this week. Exciting stuff! 🙂 But hopefully next week I can get back to working on my dining room, entryway, and music room. Previous Post The Condo Is GONE! HVAC Is Coming! Next Post Where Should The Wainscoting Go? Oh my gosh, that sounds absolutely miserable!! And the humidity we have here certainly doesn’t help. I’d rather experience dry 115-degree temps in Arizona than humid 105-degree temps in central Texas. Sometimes the humidity is so bad that it’s hard to catch your breath when you walk outside. It’s like walking into a sauna. The funny thing is that for most of my life, I was never bothered by the humidity. People would talk about the humidity, and I had no idea what they were talking about because I was so used to it. But then I moved away for a few years (Turkey and then Oregon), and I’ll never forget the first time I came back to Texas after living in Turkey. Just walking from the airport terminal to the car, I thought I was going to pass out, and I felt like the air was suffocating me. I FINALLY realized what others had been talking about all along. I completely understand that. I was raised in Florida and when people talked about ‘dry heat’ in the west I didn’t know what they were talking about – it was all heat to me. Now we live in Colorado and I know the difference! Congratulations on your purchase. We are looking to replace our old furnace and put in A/C here. I’ll be interested to see how you like your Trane. That happened fast! How exciting! SO happy for you! I remember when we first got our AC… I was pretty pregs and it was so hot (even in WNY, where it actually does more than snow). What a great change…you’ll have so much more energy just from being comfortable! (BTW, we keep a portable unit around as well…there are still always hotspots. Circulation must be a bit of a mystery.) Congrats to you and Matt! Yay, yay, yay! I am soooooo happy for you! And yes, being comfortable every day in your own home is life changing. Congratulations! My parents have an attic unit and changing the filter is very easy. Just make sure you have a sturdy step stool. Awesome, wonderful, fantastic!!! I am very happy for both of you!!! Sit back, kick your feet up and enjoy the sweetness of it all (new air system AND sale of your condo)!!! Have a great weekend Kristi and Matt!! Progress, and lots of it! Yay. Hurray and congratulations to you for selling the condo! As a woman of a certain age living in Georgia, I’m always hot and not in a good way, either. 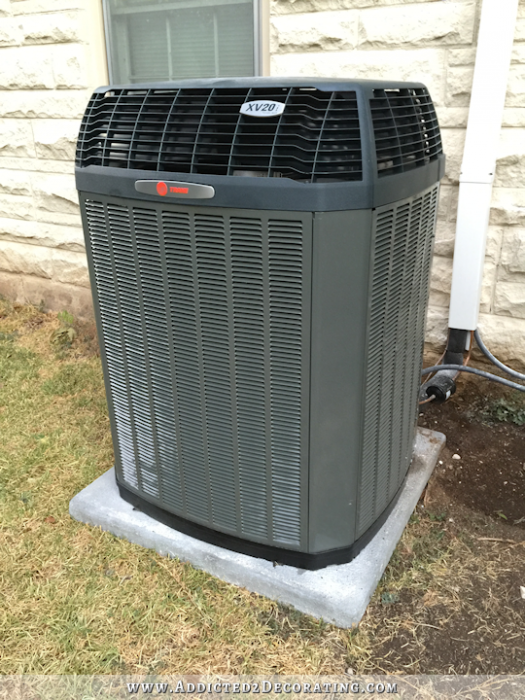 I adore A/C and that is a mighty handsome Trane system you have that I’m sure will provide deliciously cool, dry air for many years! Congratulations. That HVAC is very well deserved after all your hard work and the gorgeous renovation of your Condo. It must be such a huge relief that the Condo is sold and you’ve been rewarded with the new HVAC system. I am so happy for you and Matt! We lived with window units for many years and it was just as you described,freezing in the dining room,hot in living room.Never even temps anywhere in the house. it just makes one so appreciative when you finally get central air! 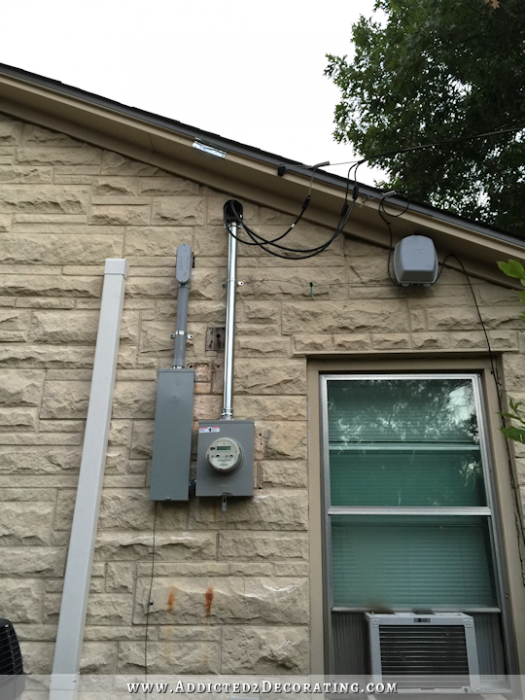 We could feel the difference an hour after it was installed. Congratulations! We’ve been having a heat wave here in California and I thank my husband every day for the A/C he had installed … for me. He was always cold. But this talk of your Trane is making me question if it’s time to replace our unit. It doesn’t really reach the last bedroom at the end of the hall. It’s been so hot that I’ve had to keep all the other rooms really cold to get that one room livable. Better call the A/C company, because the wonderful way yours works is making me jealous. I’m so happy for you! I can’t wait to see the new windows! I am so happy for you! ENJOY, ENJOY, ENJOY!! Great post,makes ME happy for you and Matt! Oh…we’ve missed you, but I had a feeling it was for a good and positive reason. Very, very happy for you and Matt. Enjoy! So very, very happy for you! It’s so wonderful to be comfortable! When I moved to Texas and the AC was in the attic that was a whole new experience for me. I have had a Trane before (not this fancy) and really liked it. The added features on this sound great. When my system dies (hopefully a few more years) I’m going to look at that one! So happy for you. So excited for you! Another big project off your list! And next the window changes. Your dining room is going to be lovely! It sounds like the installers did a superior job! And coming back to make adjustments?! Never heard of that! In our last house (in central MS), we had a similar HVAC system to what you have. 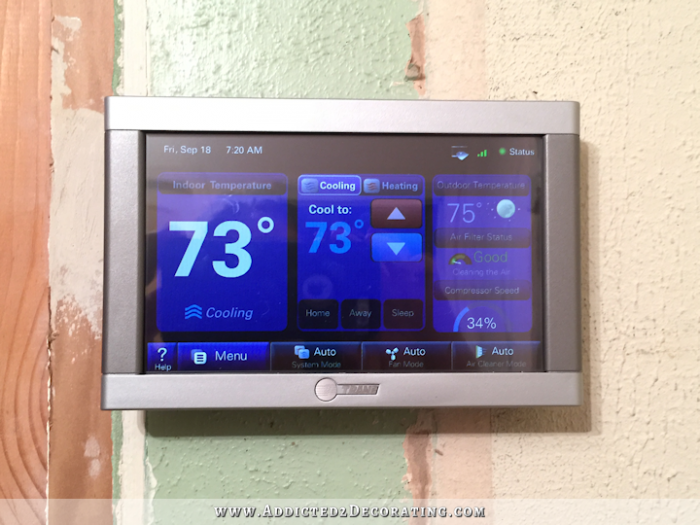 We could keep the thermostat set at 78 in the summer, and it kept it amazingly comfortable because of the variable speed. And no blasts of hot air in the winter, either. Yay!! HVAC is not perfect, there will likely be cooler spots and warmer spots still, despite their best efforts. From all I hear, that’s just the way it is – I’ve complained about ours. But still such an improvement and enjoyment for y’all! Do INsist that they direct coolest parts where YOU want, and work with them until they get it right. YAY!! You got the best unit that is on the market at this time. You will need adjustments in the velocity of air in some rooms, so be aware of other rooms beside just your bedroom. And you definitely needed the electrical upgrade. It’s a wonder you didn’t damage some of your bigger power tools by their dragging without enough power. They will all work better and safer now. Thirty-two years at a rural electric cooperative taught me a lot. So very happy for you. It’s funny the way memory works… I was born, and spent several of my childhood years, in Corpus Christi. That’s waaay south in Texas, yet I don’t remember the summers being unbearably hot or humid. However, the one year I spent as an adult in Houston… boy howdy, do Ir emember the horrible feel of summer! I guess you just don’t register some of those things as a kid. Definitely get the fall and spring checkups. They caught little issues with ours at the other house before they became big issues and it was during their slow times. I loved our complete Trane system. we had the extra air cleaners too for our allergies. Didn’t get that here, but did get the multi-stage compressor. Big difference on bills. Yes, we haven’t had our tuned much for each room. Some days it matters, some days it doesn’t. Worth looking into for Matt, though and the bedroom. Congrats on your new air conditioning. I know you’ve been looking forward to this for awhile now. So do we get to see a picture of Boo? Boo is cute, and he does look intelligent. My kind of dog – mixed breed! The best! Um Kristi? We know you’re cool. We’ve known you were cool all along. Now about Yaleana’s room……? Congratulations! There is nothing like central air to change your life. Just remember to change the filters at the beginning of each month, no matter what. Our electrician told us that it reduces the efficiency of the unit if the filters aren’t clean. During construction you should just do a quick site check more often. We couldn’t believe the difference it made. Our filters are only about $1 each so it’s well worth it. That is fabulous! It’s amazing the difference central air makes. I grew up in Louisiana using window units and attic fans and will never forget how uncomfortable it was. So i completely empathize and understand your excitement. It’s definitely a big day. Congrats and enjoy!!! Out here in desert country, swamp coolers work the very best. Especially if they are hooked up to the ducts and you get that blessedly cool and moist air flowing in throughout the house. Ours was so good the door would shut all on its own when it was on. I spent a very hot summer pregnant, and as long as I was in that house, I was OK. So happy for you that you got what you wanted. I understand humidity too. My Tucson, AZ relatives came visiting up here one summer with their 3 teenaged boys. They had the boys all excited with stories of the cool Canadian Temps. Lo and behold, we were having a typically hot and humid Toronto summer. The family was not impressed, especially the boys. It was too hot and humid for them and the guys complained terribly anywhere they went. “This heat is making us feel sick. It’s too hot to be outside! !” We often have the same temps here as Tucson but have the added pleasure of high humidity to boot. I’m sure you will enjoy your AC. You mentioned you have heat now too. Is it part of the same unit? Everyone has a furnace up herd for heating their house in the winter. The furnace runs on natural gas. Our AC units use the fan/blower system that comes with the furnace. The AC compressor us outside, just like yours. Our unit is both heating and cooling. It has a heat pump for weather down to about 32-degrees, and if it gets colder than that, it’ll switch over to electric heat. We were told that that is the best type of system, as far as energy savings, for our area since it doesn’t get below 32-degrees very much here. So very thrilled for both of you! I know you are enjoying the a/c. Here in Mississippi the humidity is awful. We get a slight break when we visit family in west Texas. We run ceiling fans all the time and have a fire in the winter even with our HVAC. I completely understand Matt’s reluctance to give up his window unit. I have fibromyalgia and even though it is not on the same level as MS, it shares many of the same symptoms. The hot/cold intolerance is horrible and can affect you for days afterwards. Looking forward to the progress on your house. Congrats on the new HVAC unit!